My most popular post, as assessed by page views, is for my Mexican Salad with a Creamy Avocado Dressing. It is a big leafy salad with black beans, tomatoes, tortilla chips smothered in a creamy avocado-based dressing. Since today is Cinco de Mayo, it has seen some extra hits recently. Cinco de Mayo: a celebration of Mexican culture (with lots of great Mexican dishes). Who needs an excuse to get together with friends over guacamole? This weekend, I will be attending a Cinco de Mayo party. The twist: the party is in Kitchener. Weather-permitting, I plan to commute from Toronto by bike. I am not joking. It will be over 120km each way. Never fear, I plan to sleep over on Saturday before heading home. Suffice it to say, I try to pack light while cycling. This means, not only do I plan to wear my pyjamas at the party, but sadly, I won’t be bringing a dish for everyone to eat. If I were to share a dish, I would likely make this chickpea salad with a Mexican mango dressing (the rehearsal was a success!). I adapted it from My New Roots, where chickpeas are tossed with crispy carrots, crunchy red bell pepper, hidden slivered spinach and fresh cilantro in a creamy, zippy dressing made from pureed mango and lime juice. Similar to my previous Mexican salad with a fruit-based dressing, this one tastes best fresh. The zing from the chili flakes is most pronounced the day it is made and it mellows as it sits as leftovers. I simmered my chickpeas with a few cinnamon sticks and really found that cinnamon complemented the salad well. Feel free to use any assortment of crunchy vegetables and your favourite green for the salad. Don’t skip the cilantro, though. This is my submission to Deb for this week’s Souper Sundays, to this week’s Weekend Wellness, to this month’s Veggie/Fruit A Month, featuring spinach and to E.A.T. World for Mexico. 1. Drain chickpeas in a colander. Place chickpeas in a large stockpot with cinnamon sticks and cover with fresh water to at least 3 inches above beans. Bring beans to a boil on the stove, then turn down heat to maintain a gentle simmer. Cook, stirring occasionally, until beans are thoroughly cooked but not mushy, about one hour. Remove cinnamon sticks. Drain and set aside. 2. Peel mango and place in a blender with lime juice, green onions, olive oil, sat and chili flakes. Blend on high until uniform and creamy. Season to taste. 3. In a large bowl, pour dressing over garbanzo beans and let sit while you prepare the rest of the salad filling. 4. As you chop up the vegetables for the salad, add them as you go and stir to get an idea on how much more you need. Stop when the salad is well-dressed but not super gloopy. 5. Serve with sliced avocado and lime wedges on the side. Garnish with more cilantro, sprouts, pumpkin seeds, or whatever you have on hand. What a gorgeous salad! For whatever reason, I rarely ever eat mangos. I’d be quite curious to try them paired the things I do eat all the time- like chickpeas, carrots and spinach. All the flavors in this sound wonderful. This looks amazing! Next time I make Fish Tacos with Mango-Radish Salsa (and inevitably end up with extra mango-radish salsa), I think I’ll toss some chickpeas in, thanks to your inspiration! This looks wonderful! I love the combination of mango and cilantro. So light and refreshing. Feel like finishing that whole plate, simply colourful and irresistible..
Wow! Sounds and looks delicious!!! 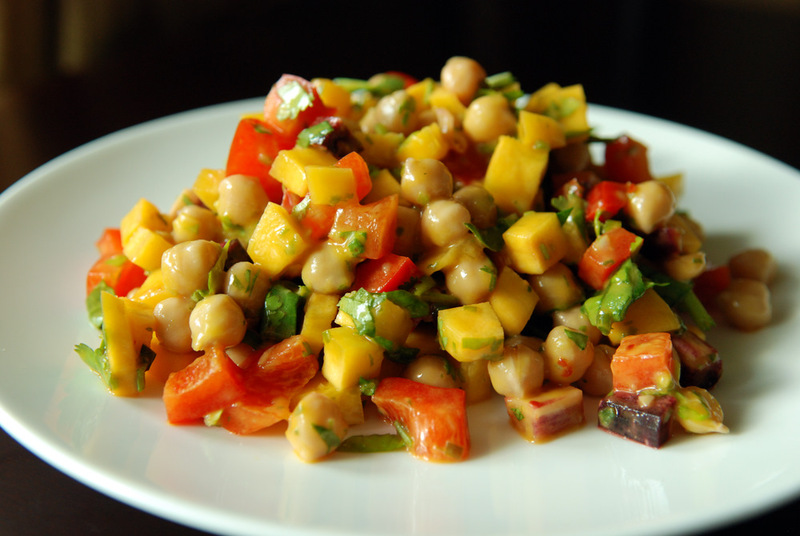 I LOVE chickpeas – that dressing sounds so flavoursome, I’ll have to try this! You amaze me! I usually think that I’m pretty insane when it comes to running and walking everywhere..but you out-insane even me 😛 Love it! I do love a good mexican dish but not when it’s laden with oil or grease or cheese…in short. This is exactly what I’m looking for. Oh baby this looks SO good. And I didn’t buy a mango this morning at the grocery! I looked at them and then passed it by. I need to get back over there so I can try this. I didn’t have any green onion but this still turned out fantastically! I think I tripled the spinach as mine is mostly green leafiness but it tastes wonderful, a perfect summer dinner. Hey Rachel, Thanks for the feedback. I agree, you can never have too much spinach! Yum! I adore the idea of mango as the dressing, and cannot wait to make this for a summer gathering! I bet it would be fantastic with black beans too. Usually I don’t like fruit based dressings but this salad sounds really good!